Electric double layers play central roles in countless technologies, from batteries to colloidal suspensions to membranes. The Squires group has coupled experiments, transport theory, and thermodynamics to delineate intrinsic scaling laws, mechanisms, and driving forces in these systems. Examples range from the charging of supercapacitor electrodes to the migration of charged particles and drops under chemical and electrostatic potential gradients, to active microrheological probes nonlinear rheological properties of complex fluids. 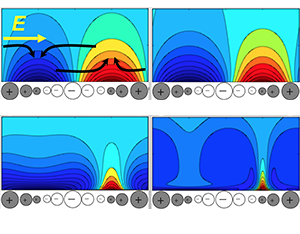 In collaboration with the Shell group, they have used molecular dynamics simulations to directly test simple models for the electric double layer models that provide new ways to analyze and interpret experimental results. The Leal and Shell groups combine transport theory and thermodynamics to understand the mysterious stability of surface nanobubbles. These very flat bubbles form in water at hydrophobic surfaces and last for days, even though classical arguments suggest lifetimes of a few microseconds. Simulations at a variety of resolutions are being pursued, from molecular dynamics to continuum scaling laws. The Israelachvili group has vigorously pursued the development of a general force-distance relationship for the hydrophobic interaction, arguably the most important non-specific interaction in biological and synthetic self-assembling systems. Their surface force apparatus experiments suggest the exciting possibility that both attractive hydrophilic and repulsive hydrophobic short-range forces between like hydrophobic or hydrophilic surfaces can be interpreted with a single theoretical interaction potential. In collaboration with the Shell group, they are pursuing a molecular interpretation of these effects in various contexts. On more mesoscopic scales, the Fredrickson group has been developing a broad suite of tools for computing potentials of mean force between surfaces separated by nanostructured complex fluids. This work is expected to guide the development of new colloidal and nanoparticle dispersions, important to a wide range of products including inks, coatings, cosmetics and personal care products.